Now that it’s finally May and it’s finally feeling like spring here in Vermont, it’s time to talk about an easy, low maintenance way to create pollinator-friendly gardens that add color to the garden all season long. We’re talking about wildflowers, of course! Many think of native varieties when wildflowers come to mind, and native varieties are important to our local pollinator population, but wildflower plantings can also include non-native, easy-to-pollinate varieties that add huge color and satisfy both the bees and the gardener. We’ll talk about when the best time to plant wildflowers is in the spring here in Vermont, along with some of the reasons why wildflowers may be a great addition to your landscape. 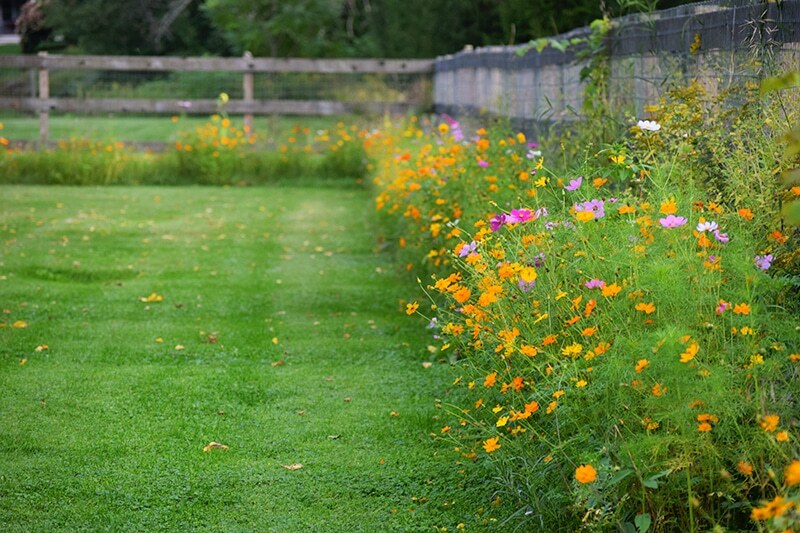 As mentioned above, wildflowers are an easy, cost-effective, and low-maintenance solution to large garden beds, meadows, replacing part of your lawn, and more. We recommend skipping most of the seed mixtures found in the big box stores and looking for only mixtures that contain 100% seed. Many reputable seed companies formulate their own mixtures for different purposes (to attract butterflies, regional varieties, deer resistant varieties, etc) and these mixtures contain a dozen or so varieties that will offer up color from spring all the way through frost. We’ve planted swaths of wildflowers in several client’s homes along their driveway, on sloped banks, and other areas to create that big statement of color with little supplemental watering or weeding. 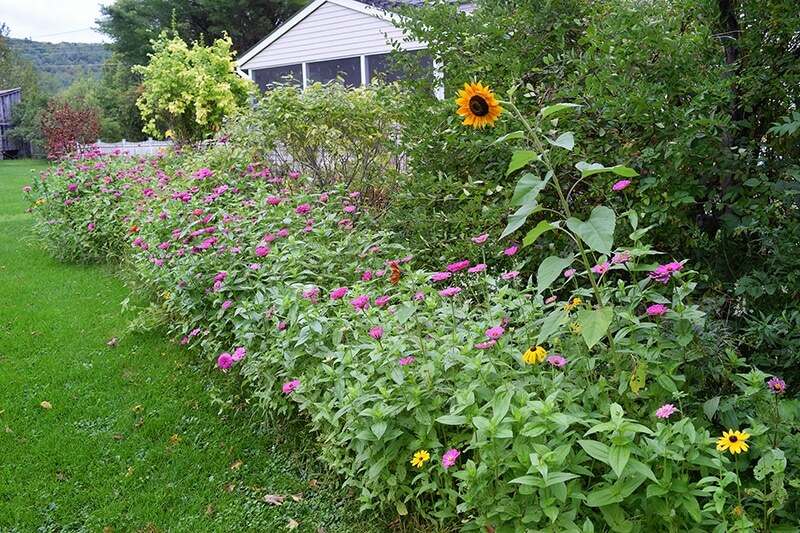 If you’re looking for a long-term planting, make sure to plant both annuals for color the first year (sunflowers, zinnias, cosmos) and perennials for color in the second and successive years (purple coneflower, lupine, black eyed susan). There are two times here in Vermont to plant wildflowers: fall and spring. In the fall, spread the seed after there have been a few hard frosts and the seeds don’t have the chance to germinate until the spring. This method mimics the way wildflowers naturally drop their seeds in nature and results in earlier blooms. In spring, plant your wildflower seed after there is no more chance of frost in your area. You can find your last frost date at the Old Farmer’s Almanac website. The last frost date for Burlington is May 10, so as long as you check the weather and don’t see any crazy lows in the near future, anytime after that date should be fine to plant your wildflowers. Another big plus with wildflowers is how easy they are to plant. The most important step to ensuring the wildflowers grow successfully — and don’t get overrun by weeds — is to prepare the soil ahead of time. Clear all existing growth from the area (weeds, grass, etc) and either till or rake the soil. Wildflowers thrive best when planted on completely bare soil. Once your soil is ready, sprinkle the seed on top of the soil and either step on the area or use a seed roller to compress the seed into the ground. Give the planting a good watering and water every other day (if it doesn’t rain) until seedlings are a few inches tall. After that, as long as we’re having regular rainfall the wildflowers don’t need supplemental water. At the end of the season (or in early spring) use your mower to mow the area down and that will help annuals drop seed for next season. It’s really that easy! We’ve been incorporating wildflowers more and more into our plantings and find that they are a great way to add pollinator-friendly plants to our client’s landscapes. 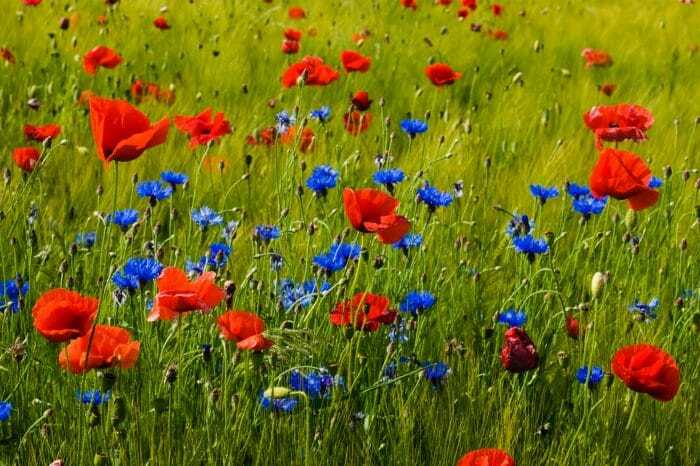 Is this your year to try wildflowers in your garden? If so, please share a photo on our Facebook or tag us on Instagram at @DistefanoLandscaping.